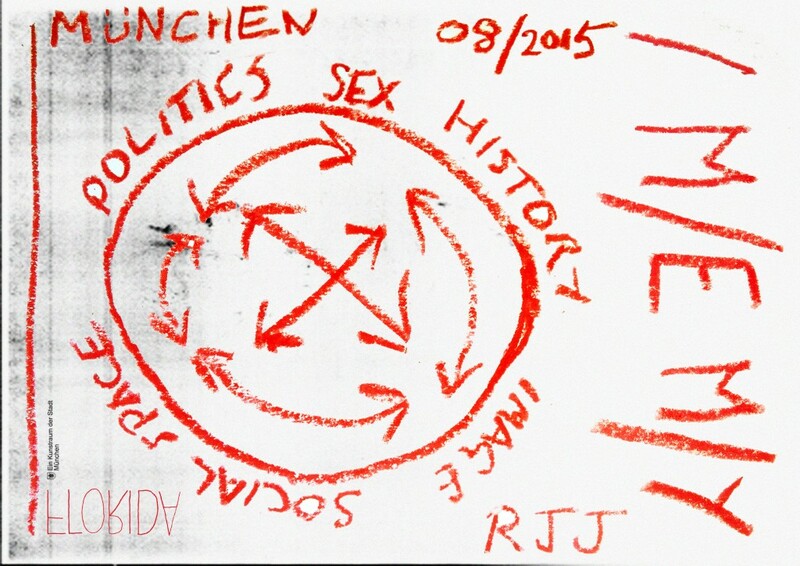 I m/e m/y is the title of a residency during which Richard John Jones will research into lost lesbian, gay and queer spaces in Munich, manifest a social space within Lothringer13_Florida, and produce a short film deriving from the material uncovered during the residency period. The research will aim to recover partial and personal recollections of spaces and the stories that unfolded within them whilst considering why these social spaces are rapidly diminishing across Europe. Points of interest are the Internet’s impact on forms of sociality and identity formation, access to minor histories and digitised sub-cultural material, and the changing needs or desires regarding physical/localised social space. The research will also engage with queer intergenerational differences and commonalities and the impact of property speculation and the social impoverishment caused by new governmental policies. In partnership with key local partners and the organising committee of Lothringer13_Florida – a social space will be opened temporarily within the art organisation towards the end of August, information on opening hours and programmed events will be available on the Florida website. This temporary space will take the form of a lesbian bar and trade under the name Moby Dyke. Playing host to a short series of public events the space is intended to host discussions, screenings and presentations that reflect a discourse already taking place regarding the diminishing social space for lesbians in Munich. The Moby Dyke will also stand as a political provocation emerging from the recent closures of women’s and lesbian spaces across Europe’s cities. A short film will be produced as an outcome of the residency that will reflect upon the materials gathered and will be staged within the Moby Dyke. The title references the English translation of Monique Wittig’s use of personal pronouns in Le Corps Lesbien (1973). Reflecting upon a perceived lack of vocabulary and language as a poor tool for the description of an otherwise invisible, erased or marginalised experience – her splitting of pronouns such as j/e and m/a was symbolic of a constant dispossession or alienation with what the 1st person pronoun in French literature represented. Over the course of this residency this symbolic dispossession will reflect the difficulty of representing minor histories – the paradox of speaking from the margins and the inevitable dispossession that takes place through its wider dissemination. Richard John Jones (b. 1986, Chesterfield UK) is an artist based currently in Marseille, France. His work explores the formation of community, minor histories and the forms of representation or visibility of marginalised subjects. Between 2011 and 2012 Jones was co-director of the artist-run space Auto Italia South East in London. His programming, done in collaboration with Kate Cooper, focussed on archival feminist film, self-publishing, the intersection between art practices and political activism, and also live broadcast; beginning in 2009 with his live film work Proh’soh-pa’peer, 2009 and continuing into the internet-based live television series entitled Auto Italia LIVE (2010-2012).